How do you get more Facebook Page “likes”? Once a week, at minimum, I am asked by my boss what I am doing to get more “likes” on our VITP Facebook Page. Firstly, how do get more people to “like” your Facebook Page? Secondly, how do you maintain an engaged and active audience? Dynamic Facebook pages that offer relevant, current and consistent content seem to dominate. People like looking at photos and reading interesting posts. Personality and sociability of posts are also key. It’s not about simply adding likes, it’s about creating an interactive page where people naturally share, comment and post because they want to. We use our VITP Facebook Page to help promote what our companies are doing, to share stories and to keep our fans up to date on what’s happening around the park. Social media experts estimate 1 Billion new “likes” a day. Fan pages have completely changed the way we speak to our clients, customers and stakeholders. By “liking” a page a fan is requesting to be updated. Up until a few years ago, companies were blocking the use of Facebook by employees. Now, social media, or the management thereof, has become a part of my daily job. I don’t pretend to be a “guru” but I have learned a few do’s and don’ts over the years. So in an effort to avoid being fired for not doing my job well enough (just kidding) I naturally turn to one of my favourite tools, Google. In short here is a summary of what I found. 4) Add your page name to your business cards, letterhead, email signature etc. 5) Install a “like us” button on your website, blog, etc. 10) Finally and most importantly, deliver an exceptional experience. If you want to get deep into the strategy of posting, an article on Mashable Social Media stresses the use of photos, talking in first person and the timing of posts to increase sharing and comments. My short list above is simply a selection of a few best practices. Always remember that too much of a good thing can in fact be too much. You want to avoid over posting and annoying your fans causing them to hide you in their newsfeed or even worse “unlike” your page. 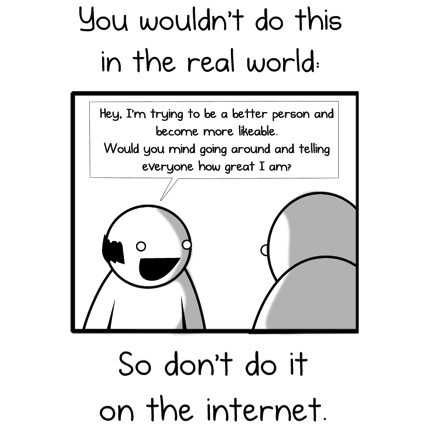 The Oatmeal posted an excellent article on what to avoid and I will leave you with one final thought. Actions speak louder than words – you must BE likeable, don’t just say you are.